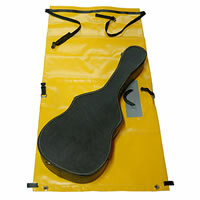 The CLAVEY Guitar Bag, manufactured by JPW has a capacity of 6 cubic feet, features two stainless d-rings and corner grommets. It's 6 cu. ft, 170 Liters, and 19″ dia X 51″ tall when filled full and rolled down to maximum volume. There's plenty of room to add additional padding. 19″ dia X 51″ tall when filled full and rolled down to maximum volume. From Kevin Lay of Scappoose, Oregon on 5/18/2018 . From wjfreds of Oak Hill, West Virginia on 7/9/2017 . From Cole McBride of Vancouver, British Columbia on 8/6/2015 . From Keith of Jacksonville, Oregon on 10/13/2012 .